Almost 6 in 10 (55%) of melanoma skin cancer cases in England are diagnosed via the ‘two-week wait’ referral route. This proportion is high compared with the average across all cancer types. More than 9 in 10 (92%) of these cases with known stage are diagnosed early (stage I or II). 5 in 100 (5%) of melanoma skin cancer cases in England are diagnosed via an ‘other outpatient’ route (either through self referral, consultant to consultant referral or other type of referral). 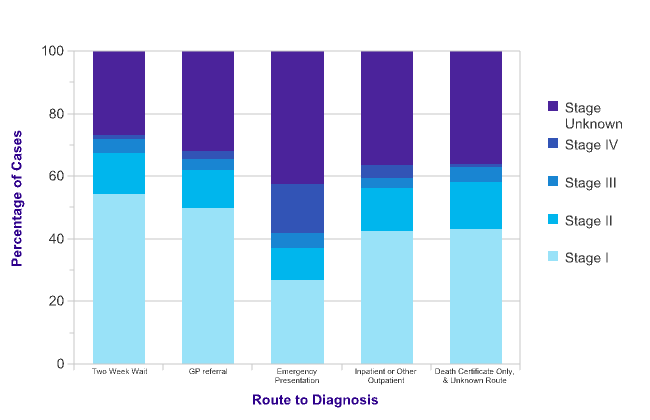 Combining these patients with those diagnosed as an inpatient, around 9 in 10 (88%) of these cases with known stage are diagnosed early (stage I or II). Only 2% of melanoma skin cancer cases in England are diagnosed after presenting as an emergency. More than a third (35%) of these cases with known stage are diagnosed late (stages III or IV). 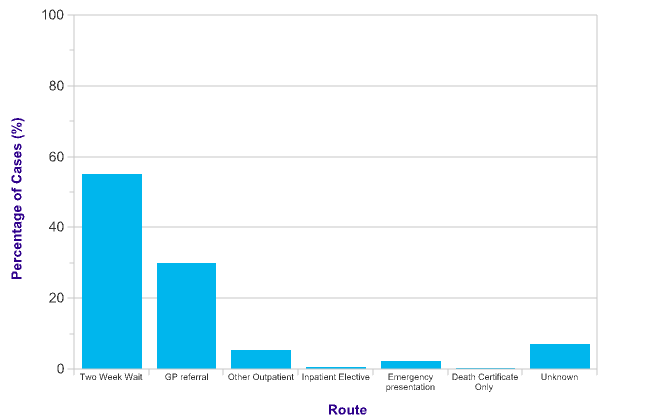 Around 6 in 10 (58%) of emergency presentation cases are via Accident and Emergency (A&E), with the other cases coming via an emergency GP referral, inpatient referral or outpatient referral. Patients with in situ melanoma skin cancer may be treated with radiotherapy. Patients with metastatic melanoma skin cancer may receive radiotherapy often alongside chemotherapy for palliative care. Some patients with melanoma skin cancer may receive supportive care and observation only. Data is from evidence reviews of studies from UK, Australia, Canada and the US, up to 2005, and 2006-2009, ICD C43.